ATTENTION AIRR Members Your Photos are being stolen! I was browsing etsy and came across this profile and noticed all the pictures were stolen from AIRR members! I noticed it right away as I see people I've had vigils lit with before and recognized the pics from their profile. The person is claiming this is their work. hope this was the right spot to put it. Re: ATTENTION AIRR Members Your Photos are being stolen! Spellkiss: Thank you for the alert and the link. Hopefully Miss Cat will see this thread soon and take the appropriate action. looks like they switched the pics I'm guessing they've replaced AIRRS pics with someone elses who aren't really well known. You can still see the stolen pictures if you click on her sales link. I have a screen shot and it shows a stolen picture from the AIRR pages of Flora, Sindy Todo and Apollo Dark. yes they are still shown where you can see the reviews for "her" products.,looks like someone made another review on her site today being positive not good. Watch Out for Fake Rootworkers Selling Imaginary Spells! In August, 2013, a pseudonymous person calling herself "Amelia" created an Etsy shop called "HoodooSpellcasting" and promptly uploaded a vast swath of imaginary spells for sale. We call them "imaginary spells" since ALL OF THE PICTURES CAME FROM AIRR -- which means that "Amelia" has never cast those spells on her own altars! 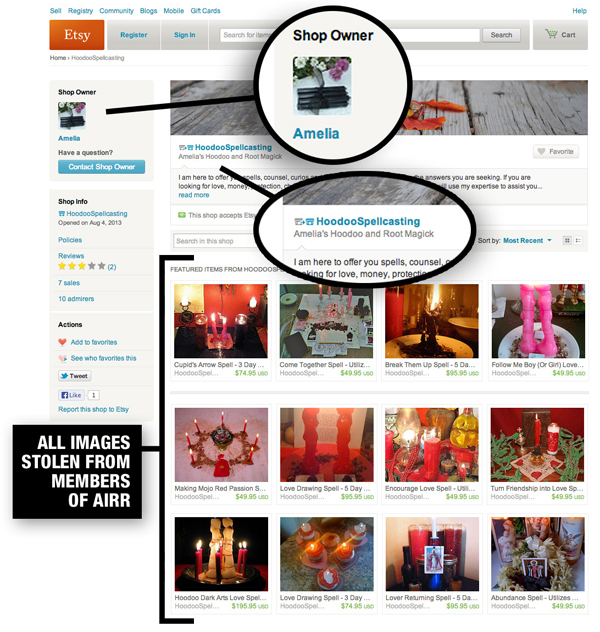 We, the members of the Association of Independent Readers and Rootworkers -- 30 legitimate practitioners of hoodoo -- reported her Etsy shop for false impersonation and for multiple copyright violations. We sent a DMCA takedown notice to Etsy for the immediate removal of our photos, but merely forcing her to take down our images is not going to stop her fraud. discerning eye can tell if a watermark has been removed and you can therefore prove it is not their image. Akita, I think that's a great suggestion. I would certainly do that with photos of mine! Thanks for bringing it up!